Sometimes exact translations don’t quite work, do they? Subtle thing, this language business. 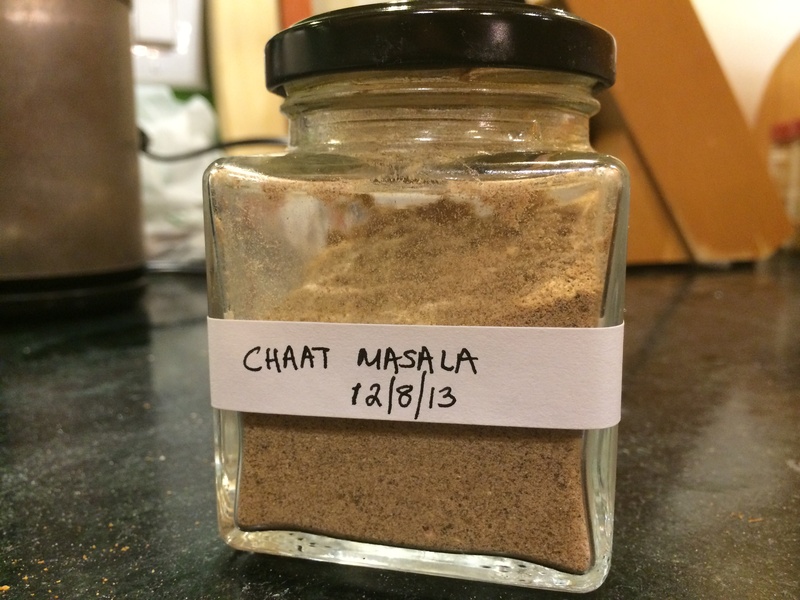 Anyway, ‘chaat masala’ — so named because it is supposedly so delicious that one wants to lick — it? your fingers? — at any rate, one wants to lick some indeterminate thing — is today’s topic. ‘Chaat’ means ‘lick’ and ‘masala’ means spice mix in Hindi. Chaat masala is sprinkled on all manner of delicious snacky, faintly junky food, that are often eaten at street vendor stalls in the warm evenings while out on a stroll with your pals. In fact, many would claim, chaat masala is often responsible for the deliciousness. Making one want to lick stuff, is the key. Here is the mix I use in my kitchen. I always have a jar on hand and hate myself when I don’t. So don’t be that person, and do make this mix. Modified from 1000 Indian Recipes by Neelam Batra. I realize that some of you will have to make a trip to an Indian grocery (if you live outside India) to collect these ingredients. Just be sure you don’t come back with a ready-made mix of chaat masala, though that will probably be available too, because that will wreck the whole point of this post. Heat a small thick-bottomed pan on a medium-high flame. 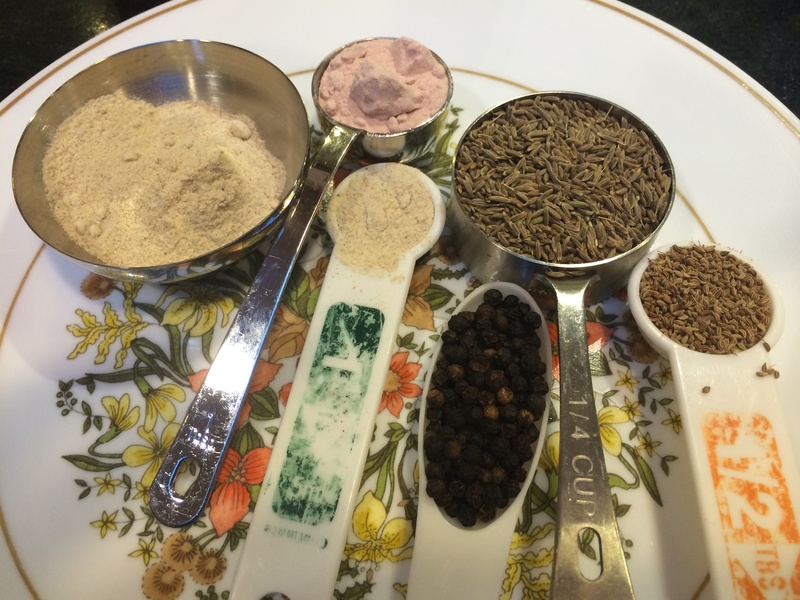 When it is hot put in the whole spices (cumin, black pepper, carom) — individually, because each of them will take a different amount of time to roast. Stir gently, and roast each spice for a couple minutes until they turn a shade darker. Empty into a bowl. 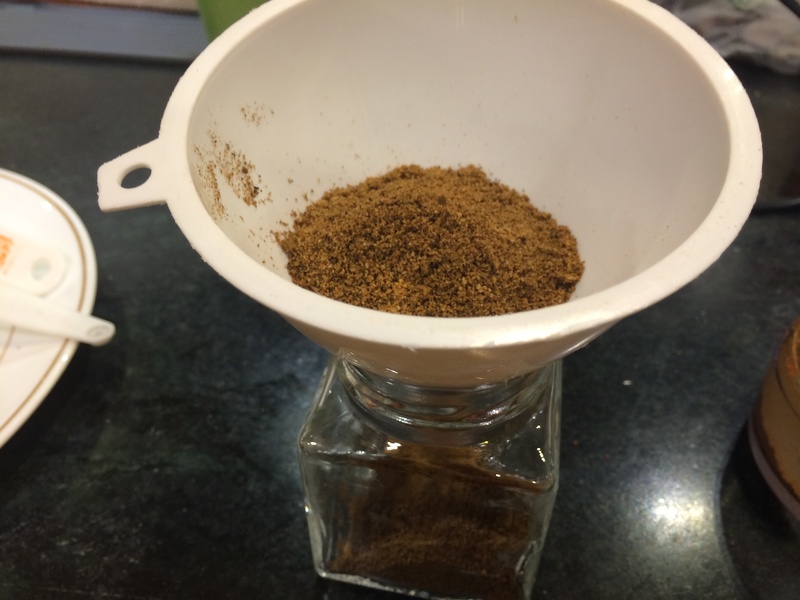 Using a clean coffee grinder, powder the three whole spices. Then pour into a clean jar with a funnel along with the other three already powdered spices — asafetida, black salt and dry mango powder. Close the jar tightly and shake to combine. Label it and date it. Bwah ha ha ha! Never thought what chaat masala translated to! You are hilarious! 🙂 And thanks for the recipe!